with her husband Sir Otto looking on. 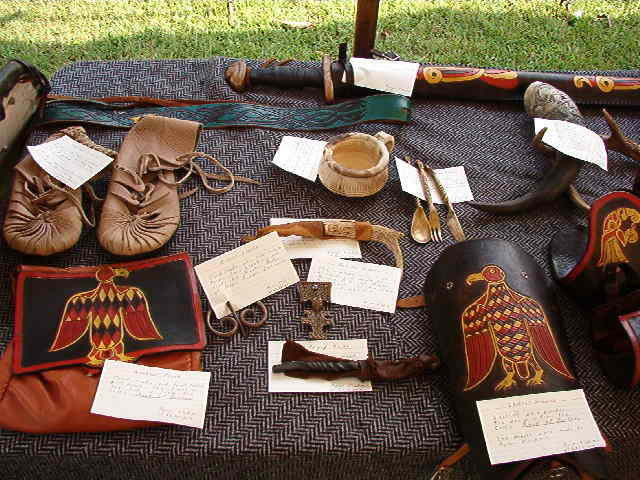 A display of Leather workings. 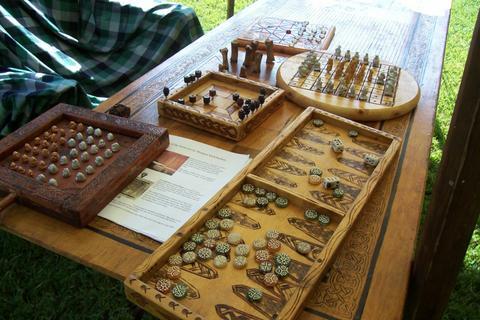 It doesn't matter if your desire is to master a craft or just dabble, if they did it in the past you'll be able to find someone doing it now in the SCA, and Marinus is full of wonderful artisans! 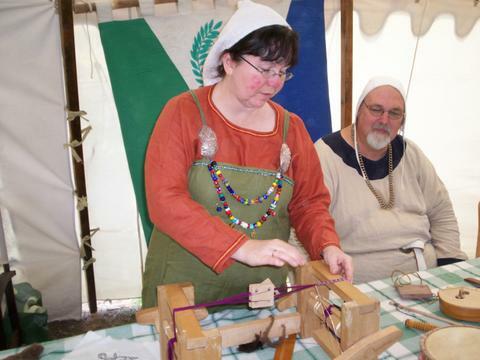 Learn leatherwork and you can make footwear, pouches and armour. Take up embroidery and you can decorate garments, accessories, tapestries, purses, coifs, and so on. Bang on metal and turn out: armour, silverware, metalworking, and pewter-casting. Enameling can create brooches, rings, belt-buckles, and jewelry. Knitting allows you to create stockings and caps (or try your hand at knitting's Viking-era ancestor, nalbinding); lampworking can create lovely beads for necklaces. There's also pottery, painting, weaving, storytelling, riddles, woodworking, spinning, making chainmaile, beadwork, candle making, poetry, acting, soap making and much, much more! Like the rest of the SCA, we strive to learn through doing.